Swish & swirl to your heart’s content in our full circle Bonny swing skirt. 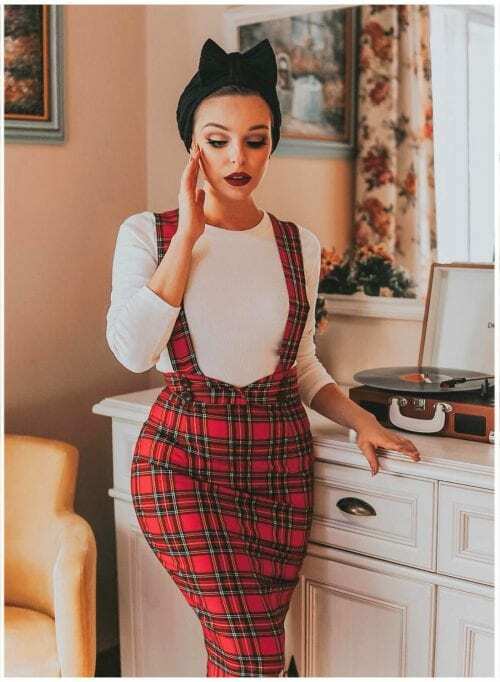 This skirt is made from an easy care, warm feel, woven Black Watch Tartan with lashings of fabric and all the checks have been carefully matched on the seams. She fastens with two brass buttons & we’ve made them with loops on the waist, so you can wear up to a 2” belt. This skirt looks great worn on it’s own but can be dressed up by popping one of our Black petticoats underneath to create the perfect 50s look. The petticoat is sold separately. Beautiful skirt. Nice colour and smooth fabric. I received it very quickly in France. Absolutely gorgeous skirt, i’ve never received so many compliments on an item of clothing before! Every time i wear it people come up to me to tell me how much they like my skirt. I would love this style of skirt in more colours or fabrics.